Euros Rx Diabetic Crew Socks - By SOCKWISE INC.
Euros Rx Diabetic Crew Socks created by vascular and podiatric physicians, these socks are designed to provide maximum comfort and protection for diabetics. They are seamless and have a moisture management system with fibers that control bacterial growth and minimize odor. Other features include: a woven arch support which helps relieve the effects of Charco foot and tarsal degeneration; a mild ankle brace for enhanced lateral and medial support; a flat knit toe seam, maximizing protection against irritation and a padded terry sole for ultimate comfort. 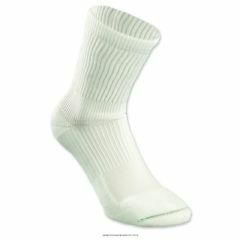 The socks are constriction free and have dual tone technology for rapid detection of wounds. Made in Italy, one pair. I need to know if the diabetic euro crew socks size "LARGE" fit a mans shoe size 13. I know most prodcts from Italy run small, but I can't buy if they are small. I will be buying as a gift for someone. I need to know if the diabetic euro crew socks size "LARGE" fit a mans shoe size 13. I know most prodcts from Italy run small, but I can't buy if they are small.